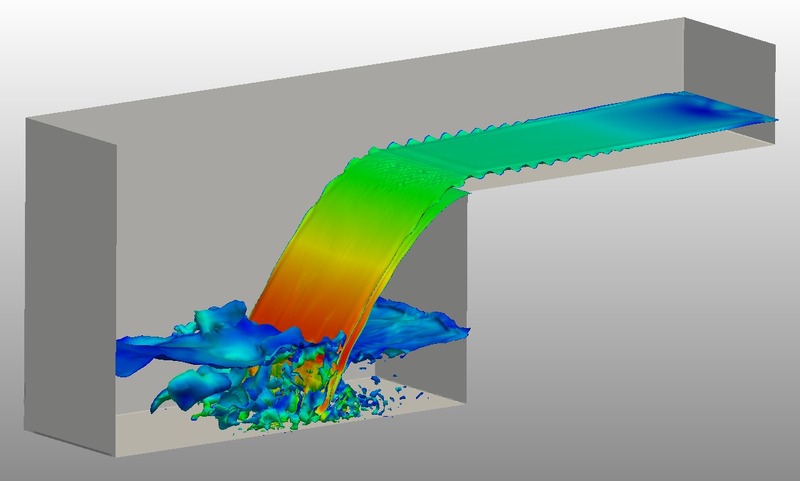 The multiphase fluid flow analysis could be used to simulate the behavior of a mixture of fluids and their interactions. The analysis is carried out using the VoF (Volume of fluid) method which is a standard approach for the computation of multiphase systems. In the following, multiphase simulation setup is discussed. All cases are modeled as transient. Multiphase simulations are performed using the OpenFOAM® solver interFoam. In order to perform a multiphase flow simulation on a given domain you have to discretize your geometry by creating a mesh. Details of CAD handling and Meshing are described in the Pre-processing section. For multiphase simulations, physical properties of each phase need to be set separately. Therefore, kinematic viscosity and density of the each phase should be defined. Furthermore, surface tension between the phases and gravity are required. Concerning turbulence models, if LES is being used, LES delta coefficient should be set as well. In a multiphase simulation, the computational domain will be solved for three fields: pressure (p), velocity (U), and phase fraction (alpha).Depending on the choice of solver, additional turbulent transport quantities may be included. As a general rule for CFD simulations, all field conditions must be well-defined on all boundaries. Therefore, it is very important to define appropriate initial and boundary conditions for all variables on every boundary. Alternatively, SimScale provides the possibility to use a potential flow solver to initialize the field before starting the actual simulation. This option is available in Simulation Control. Multiphase flow analysis is performed using the OPENFOAM® software. See our Third-party software section for further information.